A Las Vegas man has started keeping track every time his power goes out and he wants to know why the lights in his established neighborhood near the Strip just won't stay on. Some homes just north of Desert Inn Road between Maryland Parkway and Eastern Avenue date back to the 50s and the power grid supplying electricity is also aging, according to people who live there. James Katzen has lived in his ranch-style home since the '90s and says recently he has heard explosions rock his neighborhood. "It was scary as heck, I'm telling you," said Katzen while describing an explosive boom just before a recent power outage. 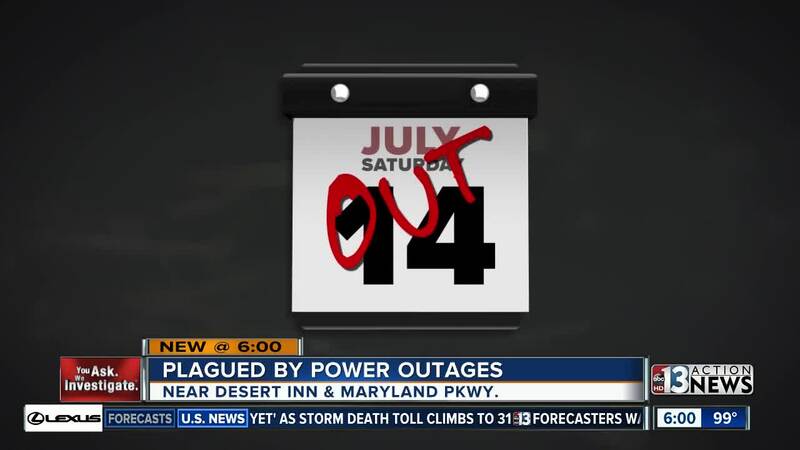 Katzen provided 13 Action News with a hand-written calendar of documented power outages since July. "It was out again for about a minute to a minute and a half and then I heard another explosion which sounded like it was on the east side," explained Katzen. Katzen said just within the first week of September, his neighbors have been without power 3 different times. "Every time we have heavy rain or a wind storm, we lose power," explained neighbor Reggie Wing. Katzen said weather cannot be the only explanation behind the power outages and questions if the age of the infrastructure is playing a part. According to a tweet from NV Energy , this monsoon season was particularly harsh on power poles. Storms around southern Nevada damaged or snapped 93 power poles this summer, which is nearly as many as the previous 8 years combined, according to NV Energy. 13 Action News has reached out to NV Energy regarding the power problems near Maryland Parkway and Desert Inn. A spokesperson said the number of outages in the area were "unacceptable" and they are taking steps to improve reliability. A spokesperson says teams continue to make other repairs and will not stop until they are fixed.